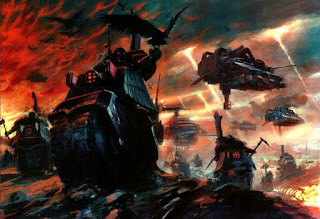 We've all seen this Ravenwing picture to me it's the most iconic representation of how I feel the Ravenwing should look - dark, brooding and menacing. I've said many times that I am not a fan of the white wings on Ravenwing, Ravens are black, they are not Magpiewing [much as I love Magpies for all their cheeky antics]. Now I will concede the Ravenwing symbol being white, but aside fro a small white symbol I don;t see these guys painting bits of their dark bikes white to startle their prey in the hunt. Sure Space Marines don't always acknowledge the tenets of camouflage but in this instance I guess they do, they have a floating caouflage mahine anyway so hiding from their quarry seems to be their thing. Which is what I've done. My Tyranid claw highlight was put on first [black and old Anita's Turquoise], then it was new Anita's Turquoise gently applied [I used the new one because it's coverage isn't as opaque so I knew I could manipulate it with multiple layers to belnd with great result for only the cost of repeated application]. I'll flat out say I love the results and the technique is so easy if I go down this road I may well blow the 'white wings are and obstacle to progress' issue out of the water. the artwork above are these colours because it's dark in the scene, is that what's conveyed by my efforts or does it just look like blue wings? is this contextual? Can I make a decision without having applied the verdigris and additional black highlights to the bike? could I even apply and additional grey highlight to the feather edge to imply it's lighter? does the fact I haven't gone white remove it too much from the 'spirit' of the Ravenwing? And a whole host of other niggling doubts, I'm chuffed with what I've done but uncertian with whether it;s appropriate for this application so your thoughts would be appreciated, it may be too soon and the best thing to do is finish the highlights on the black and do the Verdigris and complete this as a test [something I usually don't do]. I kind of thought last night sod it, just go with it being different, they're my toys afterall! Additionally I highlighted the canopy of the Jetfighter, also the extra bit at the top. I actually sponged on the highlight thinking the added texture would help me as it has with the Knight but I think it just makes the finish look poorer for it. 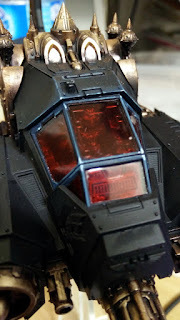 Still, it's built confidence for the black on the Ravenwing, something my Land Speeder failed to do! I think you are on exactly the track with how they appear in the first photo. They still come across 100% as Ravenwing. That fighter canopy is to die for. Cheers Rory, hopefully the Fallen will think the same about the canopy just before I bring about Crushing vengeance on their heretical souls! Love the broody menacing Raven colour you've achieved. 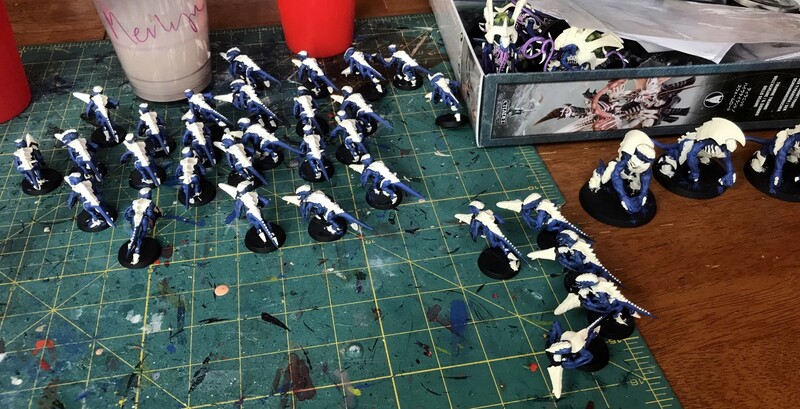 I think bright white feathers is dumb, especially enmasse, makes a black biker army look like white scars from a distance, so do what you are doing, looks ace. Thanks Siph, nice to know I've got the support to give me confidence to progress. Yeah it's great! Definitely still come across as ravenwing, if it bothers you you could always try out the feathers before applying the turquoise? Not too much, just enough to suggest they're not the same colour as the bike? Maybe just a little extra highlight might do it...? 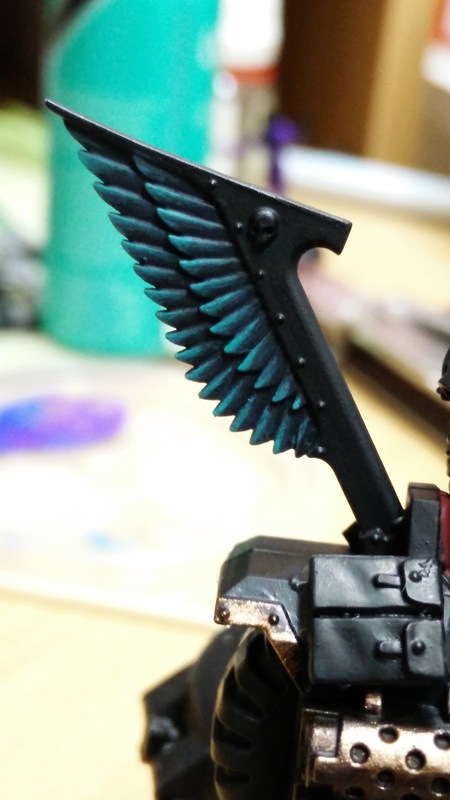 Perhaps just lift them from black a little before the highlights, a really dark grey would just give enough contrast with the black but would still highlight nicely with the turquoise? 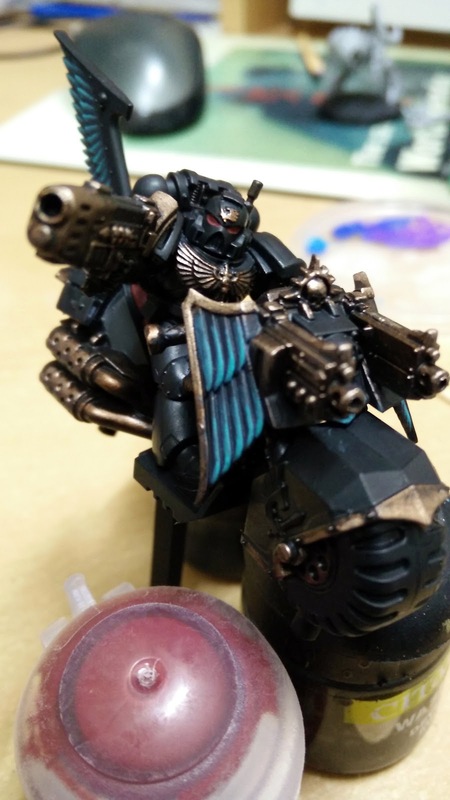 Running into the same issue with my Raven Guard - want them to be a midnight blue black, but when I finished it came out looking too blue. My solution was to bring back the highlights and just do very thin lines. This way you get the turquoise highlight coming through, but no so much as to make us think they're actually blue. My thoughts - I think the idea is great and the execution is good, but maybe bringing back the highlights could help the execution be perfect. So reducing the turquoise and introduce more black? I've added a black wash which has darkened it a bit more, think I need to do the rest of the bike so I can compare further options. I think it works really well. Still clearly ravenwing but more practical and more menacing. Admit it though, it's just so you can squint and pretend you're still painting nid carapace! As for the silver, I have one other set of bikes with that so maybe I should escalate them to compare. However the bass and bronze is part of my unifying theme for all my Dark Angels. With so much variety in their colour scheme the metals were the one tieing it altogether. 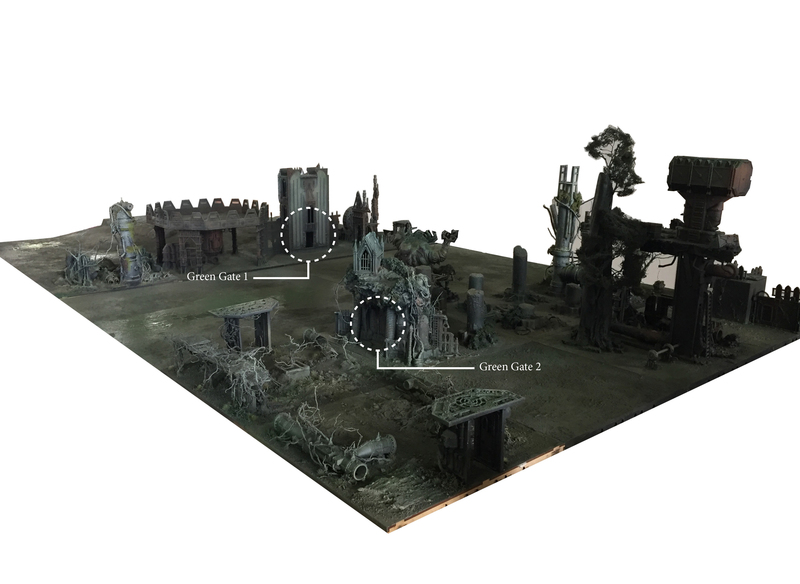 Anyways the fact the metal weathers and changes, which is a bit backwards in its use seems to fit the technol fear of the new attitude in the grim dark universe. The alternative - rusty steal doesn't work but the blessed Patina of the verdigris of Caliban, now that's something to venerate! The red tone of the Dark Talon's canopy is great too. 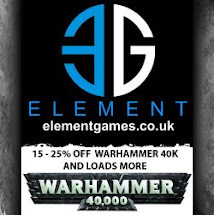 Yeah I thought about a very, verya dark green, its extremely difficult to achieve though and you risk ending up with the look of the Dark Eldar. There is the studio model of the new assassin that may be what you're after though, that's really good. Oops sorry i meant to paint the feathers in green. I agree with that greenish glow in black armour would give a feel like Dark Eldar.. Cheers Dave, I think the overwhelming consensus is beginning to sway me to not try white at least. That bike looks fantastic. 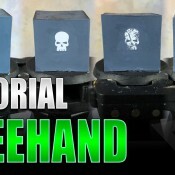 I always do a test mini when I am about to do a squad, so I would recommend you finish this one and get a good handle of how all of the effects look combined. 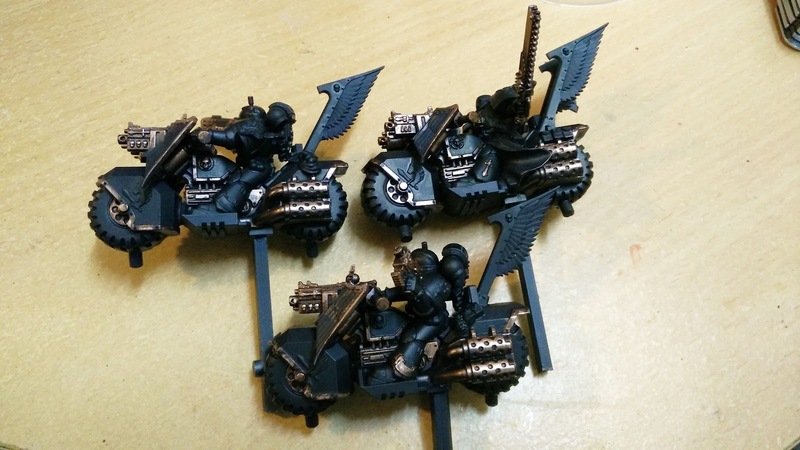 Add for highlights, I always hard-line black models. It is grueling work but every other technique seems to compromise the "blackness" of the scheme. Thanks Marc, I think I'll pursue this one until completion, or at least lay the black and verdigris down so I have a faithful comparison to judge in context. I totally agree with you on the white Dave it's not what I would want either, the job you've done on the test bike looks very fitting imho & if I where you (then I wouldn't be commenting lol) I'd carry on down that road mate. As a ravenwing player, I too am tored of yhe standard "white" feathers, for my regular bikers I went with a heavy washed, weathered metallic boltgun. For the specialist bikes ala black knights I opted for a high gloss silver, toned down with successive washes of black, blue and purple, these were used in an attemptto evoke the multihued facets of a true raven or crow's feathers. That being said, I am truly jealous of the success you achieved with the verdigris. Well played good Sir, well played. Sounds like an interesting approach and I love the raven references, I tried that on some of the fetish feathers on some of the Deathwing, not 100% convinced it worked but wasn't too bad either.